Several weeks ago one of my customers met with Kaihan Krippendorff, author of Outthink the Competition: How a New Generation of Strategists Sees Options Others Ignore, to complete our work on the Outthinker Process. I’ve shared their progress in our previous blogs. During dinner the evening before our strategy session, one of the leadership team members asked Kaihan what books he’d recommend. 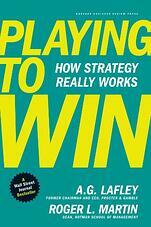 Kaihan’s favorite book on strategy is Playing to Win: How Strategy Really Works, by AG Lafley and Roger Martin. Strategy is one of Scaling Up’s Four Decisions. It is most important for business, because scaling up is about growing revenue. The result of getting strategy right in your business is: Top Line Revenue Growth. Strategy is often one of the most difficult idea to understand, and still harder to implement. 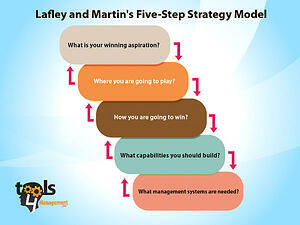 In Playing to Win, Lafley and Martin describe strategy as making specific choices to win in the marketplace. Their definition of strategy is an integrated set of choices that uniquely positions the firm in its industry so as to create sustainable advantage and superior value relative to the competition. They define strategy as a vision. Mission and vision statements are elements of strategy, but they aren’t enough. They offer no guide to productive action and no explicit road map to the desired future. They don’t include choices about what businesses to be in and not to be in. There’s no focus on sustainable competitive advantage or the building blocks of value creation. 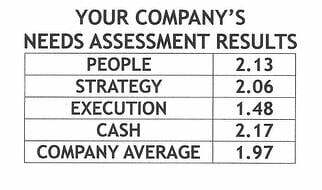 This is exactly what HBR’s “Can You Say What Your Strategy Is?” tells us about strategy. We shared this concept in Can You Say Your Strategy is in 35 Words? Does your business have a Strategy Statement, concisely offering your strategy in 35 words or less? They define strategy as a plan. Plans and tactics are also elements of strategy, but they aren’t enough either. A detailed plan that specifies what the firm will do (and when) does not imply that the things it will do add up to sustainable competitive advantage. Did you feel your annual plan or, if you have one, your 3-5 year plan is your strategy? They deny that long-term (or even medium-term) strategy is possible. The world is changing, changing so quickly, some leaders argue, that it’s impossible to think about strategy in advance and that, instead, a firm should respond to new threats and opportunities as they emerge. Emergent strategy has become the battle cry of many technology firms and start-ups, which do indeed face a rapidly changing marketplace. Unfortunately, such an approach places a company in a reactive mode, making it easy prey for more-strategic rivals. Not only is strategy possible in times of tumultuous change, but it can be a competitive advantage and a source of significant value creation. Is Apple disinclined to think about strategy? Is Google? Is Microsoft? This is a frequent argument from customers. Setting them up to simply react, rather than be proactive. I recommend Playing to Win: How Strategy Really Works to all my customers to help them grasp what strategy really is. They define strategy as the optimization of the status quo. Many leaders try to optimize what they are already doing in their current business. This can create efficiency and drive some value. But it isn’t strategy. The optimization of current practices does not address the very real possibility that the firm could be exhausting its assets and resources by optimizing the wrong activities, while more-strategic competitors pass it by. Think of legacy airlines optimizing their spoke-and-hub models while Southwest Airlines created a transformative new point-to-point business model. Optimization has a place in business, but it isn’t strategy. This is the issue with traditional strategy and planning. It provides incremental increases. All my customers are not following The OUTTHINKER PROCESS – FIRST STEP (Example) to help them achieve far greater revenue growth than previous strategic planning has generated. They define strategy as following best practices. Every industry has tools and practices that become widespread and generic. Some organizations define strategy as benchmarking against competition and then doing the same set of activities but more effectively. Sameness isn’t strategy. It is a recipe for mediocrity. Furthermore as our blog Are Best Practices Dead? It’s time to get beyond best practices. Best Practices are table stakes today. Digital Disruption is making many businesses, products and services obsolete. Today you need to be an Outthinker to keep pace and lead your industry. Question: Is your business simply playing? What would winning look like? Great organizations—whether companies, not-for-profits, political organizations, agencies—choose to win rather than simply play. Playing to Win: How Strategy Really Works, shares, “ What is the difference between the Mayo Clinic and the average research hospital in your neighborhood? Your local hospital is, most likely, focused on providing a service and on doing good. The Mayo Clinic, sets out to transform the world of medicine, to be at the vanguard of medical research, and to win. And it does. Is it time your business starting planning to WIN? The Outthinker Process is a Strategy Decision. Positioning Systems helps you navigate and determine your best strategy for your future growth. With experts like Kaihan Krippendorff we bring superior experience to elevate your idea generation and decision-making. 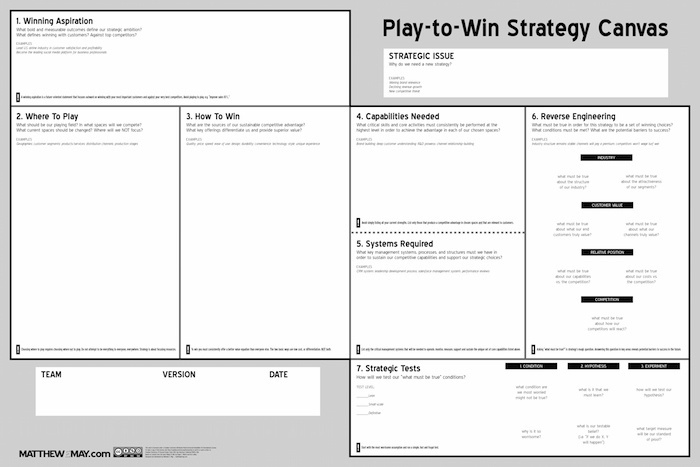 In Playing to Win: How Strategy Really Works strategy is a coordinated and integrated set of five choices: a winning aspiration, where to play, how to win, core capabilities, and management systems. We explore these five choices next blog.